Guest hosted by Charles Gustine of Iconography Podcast. Welcome to Accession. Today we’re at the Norman Rockwell Museum in Stockbridge, Massachusetts. Make your way into the main entrance of the museum through the gardens (and don’t skimp on strolling through the grounds, they are stellar). Once you get your tickets, head straight back, keeping Rockwell’s painting of the town’s Main Street at Christmas on your right, until you get to his Triple Self Portrait at the back of the room. It’s the one with the artist facing away from you, looking into a mirror that’s facing towards you, and painting a version of his face that looks quite a bit younger than the one staring back from the mirror. This painting deserves an Accession episode of its own, but the piece we’re mulling over today is actually on the backside of that wall, literally through the looking glass in this self-portrait. I’d recommend you take the long way around though, hugging the wall and turning immediately to your left. Today, we’re looking at Norman Rockwell Museum Accession number 1973.022, Freedom From Want by Norman Rockwell. Sort of. And there they are. Grandma lowering a turkey that is nearly four times the size of her head to the table; Grandpa, in a dark suit, standing behind her, feasting on the bird with his eyes; family members young and old, laughing and smiling, sitting along both sides of the table, including one man, middle aged with crow’s feet at the side of his eye that are smiling so deeply, it doesn’t even matter that you can’t actually see his smile. You know what he’s saying. He’s inviting you in, to partake of this meal. Let’s accept his invitation. You wouldn’t know it from admiring the peaceful glow given off by Freedom From Want and the other three works of art on the walls of this octagonal room in the Norman Rockwell Museum, but by standing between them, milling about the old issues of the Saturday Evening Post with miniature versions of the same images on the pages, you happen to be standing at the intersection of illustration and fine art. It’s a pretty high-traffic intersection, but the folks on either side don’t like to acknowledge they’re meeting. These are two roads that aren’t supposed to converge, but you’re staring at evidence that collisions happen, because, I mean look around you, illustration got peanut butter in fine art’s chocolate and vice versa, if you know what I mean. It’s June, 1942 in the nation’s capital, the first summer of World War II for a government still reeling from Pearl Harbor. New organizations are being created seemingly on the fly to manage the war effort. One such organization is the Office of War Information (the OWI), which will aim to orchestrate the wartime propaganda effort from D.C.
Unbeknownst to Norman, the OWI has some ambitious ideas for how to use its propaganda budget: they want to “find out if another Goya is fumbling in Iowa, or if another Daumier sketches acidly in Vermont.” And what can a renowned illustrator like Norman Rockwell, Vermont-made charcoal sketches in hand, contribute? “If you want to make a contribution to the war effort you can do some of the pen and ink drawings for the Marine Corps calisthenics manual, but as far as your Four Freedoms go, we aren’t interested." You are surrounded by the dripping Alanis-Morrissette-baiting irony of this brush-off from an OWI administrator – there are plenty of educated guesses as to who this administrator is, but we’ll respect Norman’s choice in his autobiography “My Adventures as an Illustrator” to leave them anonymous. 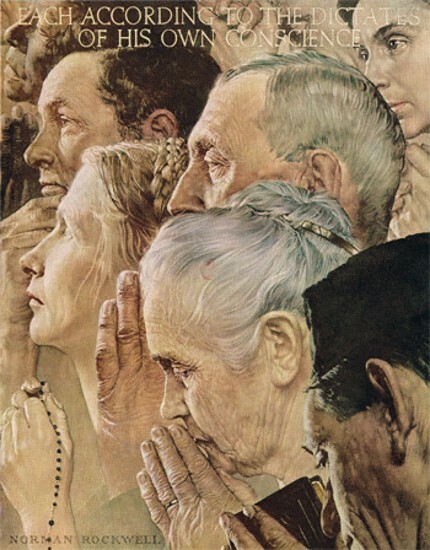 It’s ironic because, once it was clear that Norman Rockwell’s Four Freedoms were a blockbuster success, the U.S. Government was very interested. "The first is freedom of speech and expression–everywhere in the world. The second is freedom of every person to worship God in his own way–everywhere in the world. The third is freedom from want–which, translated into world terms, means economic understandings which will secure to every nation a healthy peacetime life for its inhabitants-everywhere in the world. The fourth is freedom from fear–which, translated into world terms, means a world-wide reduction of armaments to such a point and in such a thorough fashion that no nation will be in a position to commit an act of physical aggression against any neighbor–anywhere in the world." Notice how he just through that town meeting in there all nonchalant, no big deal. Directly across this octagonal room from grandma and her turkey sits Norman Rockwell’s interpretation of the moment that unlocked this series of four paintings for him. Norman was at a low-stakes town meeting in Arlington, Vermont in the summer of 1942 chewing on a notion that was tantalizingly close to becoming a full-fledged idea but just wouldn’t budge. On the other hand, the two paintings that came easily to Rockwell in 1942 and 1943 – the parents standing over their sleeping children, the family gathered for a holiday feast – are the ones that made him most uneasy in his later years. The creation process of Freedom From Want, for instance, sounds downright pleasant; after paragraphs of tortured artist stuff about how Freedom of Worship gave him fits, Rockwell says about the painting that is this episode’s subject: “I painted the turkey in Freedom From Want on Thanksgiving Day. Mrs. Wheaton, our cook (and the lady holding the turkey in the picture), cooked it, I painted it, and we ate it. That was one of the few times I’ve ever eaten the model." Sounds blissful. And yet: “I never liked Freedom From Fear, or for that matter Freedom From Want. Neither of them has any wallop.” In both cases, Rockwell, looking back from the vantage point of 1960, seemed disdainful of the way his younger self had betrayed the international premise of the Atlantic Charter and the Four Freedoms. “Freedom from Fear was based on a rather smug idea,” he laments, and there is a sort of uncomfortable comfort in the gorgeous image of a warm nighttime scene of familial security, the only reminder of the war and the suffering faced by Britain tucked away in a folded headline that’s cut off but offers us glimpses of Bombings and Killings. Time to get in close with Freedom From Want and do something difficult… look away from the smiling faces and just look at the space between them, the table – is it really loaded down with so much food that it would make Europe blanch? I'll grant you, it will be in a moment, once that monster of a turkey hits the tablecloth, but the turkey is forever caught hovering just above the table. So what is on the table? Working our way back, there’s a bowl of fruit; a closed casserole dish – who knows what’s in there; some sort of free-standing gelatin, possibly cranberry sauce; there’s a dish of celery – yuck - and a dish of pickles. At the back, there’s another tiny freestanding blob of gelatin. All the glasses on the table are filled with still water, no ice. This is the healthiest Thanksgiving meal that has ever been eaten. Ultimately, does it matter that the heart of this work is a prize-winning turkey? Maybe this family worked all year to nurture that turkey? Maybe the girth of the bird is a testament to the sweat equity they put in? Whatever the case may be, this is hardly the kind of lavish spread you would point to as an example of American excess, bird or no bird. If Norman Rockwell had wanted to make his depiction of Freedom From Want simply about the delights of avoiding starvation, he could’ve picked something, anything, other than celery to feature. Heck, the people around the table aren’t even looking at the turkey. Here’s this momentous occasion, the unveiling of the bird, the moment you’d expect everyone to be offering grandma congratulations; and instead everyone is engaged with each other, laughing at something just said, everyone except Uncle Whosisname, who’s looking away from the turkey, away from his family, out at you. You’re standing at the other end of this table – you must be, maybe you’ve just stood up because Unlce Whoisname eye's are following you upwards expectantly, maybe you’ve grabbed your glass of not-ice water to make a toast now that the meal is ready. What will your toast be? Which wants are you free from? What will you be thankful for? You won’t thank the turkey; you might thank the people that made it. But most of all, you will be thankful for the people themselves – that they have all gathered here, that the transportation was timely, and the weather was fair, and the war was kind. This is the era of the secretly heart-rending holiday tune, the Christmas song that sounds wistful and nostalgic even to our ears today because it was written that way. It came from a wounded place. These songs are not free from want. These classics are told from a remove, from the point of view of someone who wanted to be there with you but couldn’t. And as millions clamored to see the Four Freedoms in 1943 on their sixteen city tour, they saw a familiar vision of a table with no empty chairs; but a vision that had been all too rare for the past two years, of freedom from that very particular want. Millions of people did see the Four Freedoms paintings in person on their grand tour, but many millions more did not. Which does not, of course, mean that they didn’t see them. They saw them everywhere, in all the ways you’re seeing them in this room at the Norman Rockwell Museum. In the Saturday Evening Post accompanied by essays and poems and stories; and in posters plastered on bus shelters and even bathrooms pleading with the American people to help make these freedoms a reality. The rugged speaker at the town hall meeting framed by the entreaty: “Save Freedom of Speech. Buy War Bonds.” The final T in the rally cry “Ours to fight for… Freedom From Want” where Uncle Whoisnames smile would be. Those millions didn’t see the original Four Freedoms, and neither have you. For the time being, none of the four pieces in this octagonal room at the Norman Rockwell Museum are the original canvases that Norman Rockwell painted in 1942 and 1943 – they are propaganda posters, some of the millions of prints commissioned by the OWI after it ate a slice of humble pie. If you’re listening to this before 2020, the four paintings are all out on another world tour, just like they were in ‘43, roving around a world that needs reminders about Freedom of Worship and Freedom of Speech and Freedom From Fear and Freedom From Want as much if not more than the midcentury world did – the four originals might be in Michigan right now, or Texas, or France, so I can’t really give you directions to them. But that’s okay. It may not seem okay – we’re conditioned to want to be in the room with the original, get in close and see the brushstrokes, then take a selfie and show the people on social media that we were in the room with the original. (I do that.) But put yourself in a different frame of mind. Norman Rockwell, who came to prominence as a cover artist for the Saturday Evening Post in the 19-teens and used that platform to wedge himself into the American psyche, was not the kind of artist that Americans typically went out of their way to visit in museums and galleries. His work had a way of finding its way to them – where they lived. It was delivered to them, stuffed in their mailboxes, left on their front stoops, stocked on their local market’s shelves. They brought his Saturday Evening Post covers and his Boy Scouts of America calendars into their homes in numbers that would make today’s magazine and calendar distributors drool. His art became a part of family life in the home, his carefree children and barbers and policemen and young couples and gee-wiz G.I.s took a seat at the dinner table, maybe even occupied an empty seat and filled it again. Norman Rockwell made an important decision as a teenager, one he never appeared to regret, and why would he? As a young New Yorker with artistic talent, Norman was presented with two roads – fine arts and illustration – and he chose the latter. He would provide the images that accompanied consumer culture, the paintings that made it beautiful, that made it sell really. The book illustrations, magazine covers, advertisements. His dream was to illustrate a cover for the hallowed Saturday Evening Post. Norman achieved that dream by the age of 22. He then achieved that dream 320 additional times. This partnership between illustrator and publishing company doesn’t necessarily jibe with the way we conceive of the fine artist and their patron, but it was thanks to that commercial avenue that these four pieces, these four freedoms, found a home when the U.S. Government turned them down. 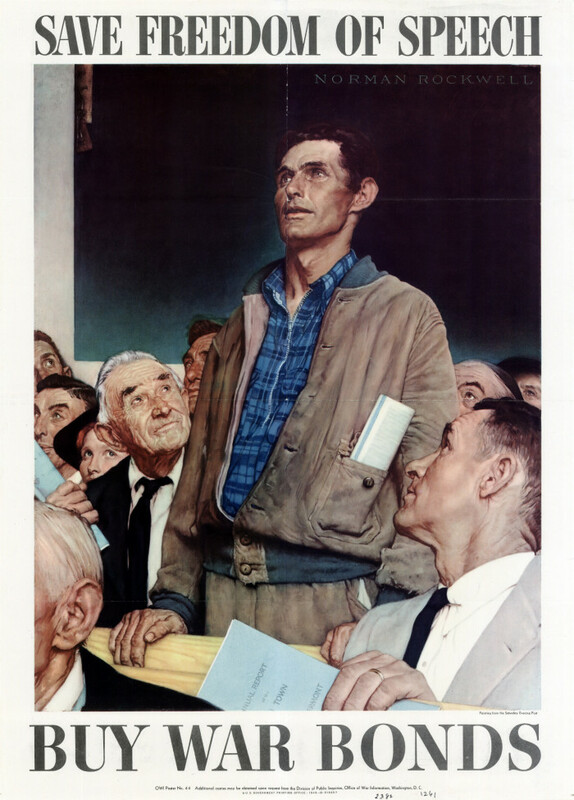 On his way back from Washington D.C. in June of 1942, a dejected Rockwell stopped by to see the new editor of the Post, Ben Hibbs, and Hibbs immediately agreed to commission his star artist for his Four Freedoms – not for the cover either, where Norman typically lived either, but for glamorous interior spreads. And ultimately, who cares what Hibbs’s motivation was when he told Norman to drop everything and focus on the Four Freedoms – maybe it was just how many magazines he thought he could sell, maybe it was patriotism, maybe in that moment it had nothing to do with art and everything to do with commerce. What does it matter when you have the art? Here you have the art. Not just these four works, but all the covers, the paintings for the Boy Scout calendars, the advertising work, the self-portrait on the other side of that wall, the one he did for the Post when he started rolling out his autobiography in the magazine’s pages. Rockwell and Hibbs may not have liked it as much as the Freedom of's, but Freedom From Want has become the breakout solo star of this quartet - the Beyonce, the Diana Ross, the Justin Timberlake. It is a moving and inspiring image that has become the great human document of Thanksgiving - it has defined its look and feel more than any other work. Freedom From Want is one of the most copied images in the Western canon, parodied and reinterpreted, generation after generation. It is unexpectantly versatile, perhaps because it still has something to say. Rockwell’s painting may seems timeless - it will always say something as long as there are holidays, and grandmas, and a feeling of home - but maybe we want (or need to be free of the want) of other things now. This was created as political art, and while we may not see it as political art any more - it is still political. All art is. Roosevelt believed his Four Freedoms were within reach, if not in his own lifetime which was coming to an end, then certainly in the lifetime of his audience: “That is no vision of a distant millennium. It is a definite basis for a kind of world attainable in our own time and generation.” Many generations on, however, you might look at Freedom From Want and its companions and think about all the ways each freedom hasn’t been universally attained. This quartet of images has room left to move and inspire us, both through careful curation and through reinterpretation. So maybe we should lean into what makes Rockwell’s vision great art, maybe even greater than art. It was made to be copied. So copy it. And copy it. And copy it. Go see the originals on their world tour if you get the opportunity, but don’t wait for art to invite you; take a page from the people of the past and invite art into your home, onto your commute, and into your errands. If it’s there already, notice it, and if it’s not, copy it. Put it where it can move and inspire, as all great art made by a great artist should do. That’s what Norman Rockwell did. That’s what Rockwell will do. Information on Freedom From Want and The Four Freedoms came from Norman Rockwell’s autobiography My Adventures as an Illustrator. Bing Crosby, I’ve Got Plenty to be Thankful For, 1943. Blue Dot Sessions, Symphony No. 40, from The Sweet Hots. Aaron Copland, Fanfare for the Common Man, 1943. Sounds Like an Earful, Take Me Home. Blue Dot Sessions, Spot Peter, from The Sweet Hots. Bing Crosby, White Christmas, 1942. Bing Crosby, I’ll Be Home for Christmas, 1943. Judy Garland, Have Yourself a Merry Little Christmas, 1944. Glenn Miller, American Patrol, 1943. Glenn Miller, Little Brown Jug, 1943. The voice of the OWI officer was performed by Buddy Duquesne. The voice of Ben Higgs was performed by T.H. Ponders. Our theme music was performed by Mike Harmon, with recording, editing, and mixing from Casey Dawson. Our show art was made by V Silverman. This episode was written and recorded by Charles Gustine. This episode was produced and edited by T.H. Ponders.